The DMK on Tuesday announced that it would contest from 20 seats in Tamil Nadu in the Lok Sabha elections, with the M K Stalin-led party finalising its seat-sharing agreements with all of its allies -- a total eight of them. The DMK's announcement virtually closes the door on Vijayakanth's DMDK, which is yet to forge an alliance though the ruling AIADMK is positive about aligning with the actor-politician's party. The DMK had earlier wooed the DMDK for an alliance. 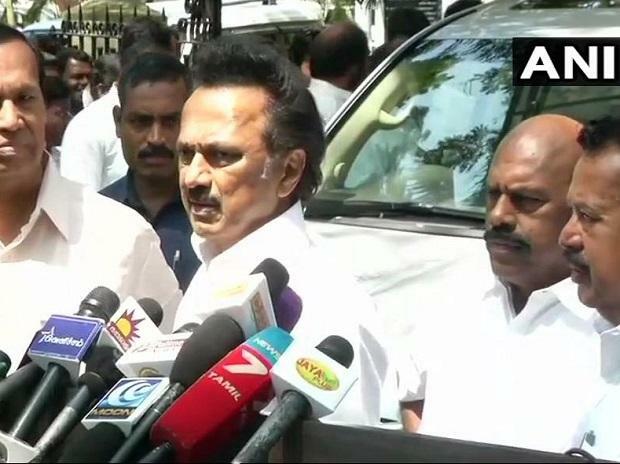 DMK president M K Stalin said his party has concluded the seat-sharing agreement with all of its allies and that the process of identifying the constituencies to allot to them would start from Thursday. The Congress has been allotted the lion's share of seats among the DMK's allies, with the grand old party receiving nine seats in the state, besides the lone Puducherry segment. On the concluding day of his party's alliance talks, Stalin firmed up the seat-sharing pact with CPI(M) state secretary K Balakrishnan and VCK's Vaiko. The parties have also expressed their support to the DMK for the bypolls to 21 Assembly seats in the state, which have been lying vacant for sometime now. Currently, the DMK has a total strength of 88 in the 234-member Assembly. While 18 seats fell vacant following the Madras High Court upholding the disqualification of AIADMK MLAs for revolting against Chief Minister K Palaniswami in 2017, Tiruvarur and Tirupparankundram segments await bypolls due to the death of sitting legislators, former DMK chief M Karunanidhi and A K Bose of AIADMK, respectively. Hosur, represented by former AIADMK minister P Balakrishna Reddy, was declared vacant recently after he resigned following a special court sentencing him to three years' rigorous imprisonment in a two-decade-old riot case. On the other side, the AIADMK has stitched up an alliance with the BJP, PMK and the Puthiya Neethi Katchi, while being positive about a prospective poll-pact with the DMDK also, which is likely to take a call on the matter soon.